To Protect Their Unique Makeup Styles, Professional Clowns Cleverly Copyrighted Which Of These? Which PC Game Was The First to Be Flown Into Space? There is a long and rich history of clowns painting their makeup styles on eggs, at first, actual eggs and then, when the original eggs proved too fragile, ceramic eggs. But why? Why would clowns from across the world paint their own faces in a form of clown self-portraiture on little eggs? The process was started by Stan Bult, a founding member of the International Circus Clowns Club, which later became Clowns International, the oldest established clowning organization in the world, as a way for members to effectively copyright their own face and enter it into a registry of clowns. To adopt the makeup style of another clown was a mortal sin in the community and clowns would both add their own makeup style to the registry and study it to avoid infringing on the look and style of another clown. Today, the largest collection of such eggs exists in the Clowns International museum located in Wookey Hole in Somerset, England. 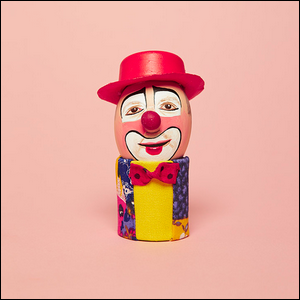 The image here is part of a fascinating book by Luke Stephenson and Helen Champion, called The Clown Egg Register, which not only photographically documents over 150 of these eggs, but pairs each photo with historical data about the clown in question. You can read more about the project here (and see more neat photos) or get a copy of the book here. Image courtesy of Luke Stephenson/The Clown Egg Register.